Peridot, pronounced pair-a-doe, is one of the few gemstones to occur in just one colour, and unlike most other stones, it doesn’t depend on light for its shimmer. Peridot has been mined as a gemstone for an estimated 5000 years. Beads were made by the Egyptians as early as 1580BC, and it was brought back to Western Europe at the end of the Crusades. People in Europe called it the ‘emerald of the crusaders’. Peridot was used in the Middle Ages to adorn church treasures, and it became a popular jewellery choice in Europe during the Baroque period. Peridot is classed as a forsterite-fayalite mineral from the olivine group of minerals. It is one of the few iodiochromatic (one colour) gems, which derives its colour from the mineral itself and not from other impurities. It is also unique for having a lustre that isn’t dependent on light – it maintains its brilliant shimmering colour at all times. 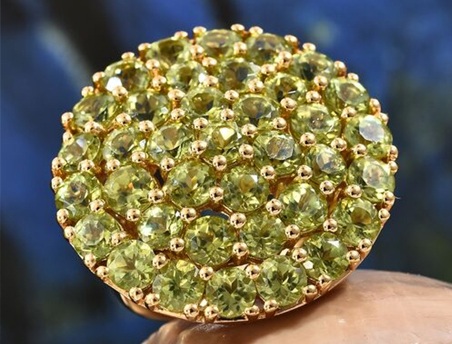 Pirates in the Middle Ages believed peridot could drive away evil spirits, especially if set in gold. But in order for it to work, the stone had to be pierced, strung on donkey hair and worn on the left arm. Peridot is known for being green, but the intensity of colour can vary within the green spectrum depending on how much iron is present in the crystal structure. Hues can vary from pale yellow-green through to olive green.